Why does a guy like Putin, with an 86% approval rating in his own country, care what the rest of the world thinks of him? Does Obama lose sleep over whether Russians like him or not? I doubt it. Yet, Putin spends tens of millions of dollars paying trolls to protect his image overseas and especially in the US. Is this motivation based on personal insecurities or is it part of some national plan? The answer is probably a little of both, because, in a dictatorship, the dictator’s personal psychological peculiarities often become intertwined with the national mindset. This mindset is often thrust upon the populace whether they want it or not because being a dictator is basically persuading or forcing others to think like you do. Thus, Putin’s employing of thousands of individuals to maintain his international image stems from his own psychological needs, neurotic fears, and, by extension, his view of Russia’s role in the world. Although it is relatively easy for dictators to limit free speech within their own countries, it is another matter trying to control it outside the country’s borders. Nonetheless, an attempt must be made to do so. It is necessary in order to short-circuit actions by foreign governments that could restrict the dictator’s powers. In a world of free-flowing digital information, things may be written in other countries that could be read by one’s own citizens which may, in turn, cause them to have some doubts about their leadership. Yet, modern dictators are caught in a dilemma. People expect to have free access to information and will become disruptive if they don’t get it. When Hungary’s Prime Minister, Viktor Orban, tried to impose an internet tax, riots broke out which forced him to back down. In fact, if a country begins to limit access to the internet, it is a sure sign that the country is on the verge of a dictatorship or is already in one. Putin has already put limitations on social media, television, and newspapers, leaving only a few vestiges of opposition outlets to make it look like he respects democracy. Of course, he can always monitor who is saying what online and take actions accordingly. He can also arrange to bring down certain troublesome websites, or he can simply muddy the waters of dissent with a technique the Russians describe as, ‘maskirovka’, or ‘a little masquerade’. Maskirovka can be described by the four Ds: deception, denial, distraction, and disinformation. Its basic goal is confusion. Confusion puts the opposition on the back foot. The waters become so muddy that it’s hard to tell what’s true from what’s not. In such a climate, the opposition (or foreign governments) cannot reach a clear conclusion on what steps to take. Maskirovka used to be primarily a military strategy, but it has now become Russian foreign policy. The new cyber ambassadors for such a policy are hundreds/thousands of former Putin youth group (Nashi) members. The Nashi youth group looks sobering similar to the Hitler Youth Group. Both groups were formed with the purpose of nurturing worship for a cult leader i.e. Putin or Hitler. Nashi unquestioningly supported Putin in whatever he did and vehemently attacked those who opposed him. They especially hated journalists and the opposition as these caused Vladimir considerable distress. Nashi repeatedly attacked and harassed recently assassinated opposition leader, Boris Nemtsov. For the most part, such attacks took the form of teenage pranks, like throwing ammonia on him or harassing him whenever he appeared. But Nashi did not only restrict itself to simple pranks. In 2007, tech-savvy members of the group organized a DNS attack on Estonia and NATO. These technologically adept individuals probably form the core of the recent troll army. It should be noted that Nashi has been morphed into other youth groups. This was clearly always going to happen for several reasons. For example, at one event for political education in the summer of 2006, Kremlin advisor, Gleb Pavlovsky, told members of Nashi that they “lacked brutality”… “you must be prepared to break up fascist demonstrations and prevent with force any attempt to overthrow the constitution”. In emails hacked from the group, Nashi leader and spokeswoman, Kristina Potupchik, remarked that Nashi was formed to “put the refuse from our provincial towns to work”. The Kremlin, in fact, needed a number of new youth groups for different tasks. They needed thugs and right-wing extremists, and, for this, they have Stal (steel). It may have been this branch of Nashi that attacked and nearly beat to death opposition journalist, Oleg Kashin. 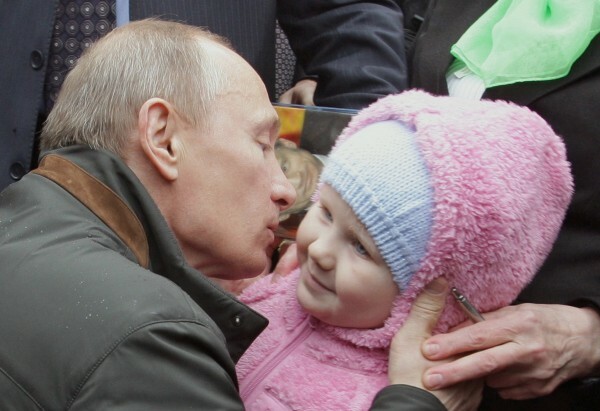 This was documented in the film, ‘Putin’s Kiss’. Stal is quite aware that it is supported by Putin. Actually, it is no secret that Putin courts right wing extremists. Almost every year he is filmed riding a three-wheeler with the Night Wolves motorcycle gang. Apparently, a two-wheeler is too much for his diminutive 5’7” (170cm) frame to handle, elevator shoes or not. In a recent CNN feature, Night Wolves leader, Alexander Zaldostanov claimed that “Putin is a gift from God”. There is almost nothing they wouldn’t do to protect the dear leader from abuse. It has always seemed suspicious that journalist Anna Politkovskaya was killed on Putin’s birthday. It was also suspicious that Boris Nemtsov was killed the night before he would embarrass Putin by holding an anti-Putin, anti-war-with-Ukraine rally. The possibility that these were ‘gifts’ from the right wing is quite high. The Kremlin still needs foot soldiers to protest at opposition rallies and the like, and, for this, they have the Young Guard of United Russia, which, by the way, has former US-based spy, Anna Chapman, among its leadership. But, as the comment above by Kristina Potupchik shows, they needed a more intellectual, technologically sophisticated branch as well. For this, they formed Network (Set, in Russian). Back in 2012, Russian hackers breached the Nashi network and learned that the Kremlin was paying pro-Putin bloggers, commenters, cartoonists, and article writers good money to support the government and harass the opposition. Last year, BuzzFeed, learned that the Kremlin was shifting its attention from reining in homeland opposition to convincing the West, especially America, that Putin is, perhaps, God’s gift to them as well. Barring that, they hoped to, at least, muddy the waters enough, by using website comments, to refute anti-Russia, anti-Putin blogs and online articles. The strategy was to make readers confused about what’s true and what’s not. Just like a fish caught in a blast of squid ink, readers would read these comments and not be sure where the real truth resided. That’s quite a workload, and if you multiply it by a thousand trolls, some of whom, no doubt, use bots, you have a daunting and disruptive internet force. The initial foray into western internet sites met with little success. The Russians used the typical juvenile troll tactics of lots of profanity mixed with racial slurs against Obama. The English was poor and the political purpose of the comments was obvious. The trolls found out that many of there comments were simply filtered out by western sites. The digital world receives an analogue response. Nemtsov supporter gets aggravated by heckler and future internet troll. They then got a little more sophisticated and began to learn the posting rules for various sites. However, they are still outed by other commenters as in the following exchange. The last comment refers to the ‘dislike’ red arrow next to a comment. The commenter was correct. Of the 61 opinions on this post, 44 were negative. Another commenter points out that the trolls aren’t fooling anyone. But don’t expect Putin or the trolls to disappear any time in the near future. In fact, expect just the opposite. The budget for this propaganda assault will be increased to a quarter billion dollars in the next two years. This is in addition to the 41% increase in the Russia Today (RT) TV budget, prompted the US to invest more money into its own counter-Putin front. RT is under investigation for numerous breach of impartiality violations, the latest involving the so-called discussion show, Crosstalk, moderated by the pro-Kremlin American and Putin water boy, Peter Lavelle. When he was called out on this by CNN’s Chris Cuomo, Lavelle went into a snit that produced one of the most hilarious exchanges in recent years. As Russia prepares for its major assault on the truth in America, it will need more and better English speaking commenters to spread the word effectively. BuzzFeed claims that the Kremlin is actively seeking expats to fill these roles. They are also seeking more tech graduates from Russian universities. It is understood that if they join the Network group, they will position themselves for better government jobs in the future. If the money is good enough, I wouldn’t be surprised if they picked up a few legitimate native speakers as well. With this help and an ever-increasing number of zombie social media accounts, they hope to influence public opinion and, in so doing, undermine or cloud the truth. As long as those in power in America are made uncertain of their footing, any moves they may make against Russia will be taken with great caution, if at all. Even if policy decisions, such as whether or not to send arms to Ukraine, are delayed by these tactics, it may be enough to keep Russia one step ahead of the West and the ‘little masquerade’ will pay big dividends. Posted on March 9, 2015 March 10, 2015 by Steve MierzejewskiTagged nashi, Nemtsov, Putin internet strategy, Putin trolls, putin youth group, Russian network group, Russian trolls, stal.